Mars One finalist Dr. Joseph Roche claims the entire operation is just one big scam that will inevitably fall on its face. If you haven't been keeping up, the Mars One operation is essentially a non-profit organization trying to send a bunch of people on a one-way trip to Mars. It's already been breeding doubt with its bold claims of being able to achieve what NASA claims is impossible (and on a fraction of the budget, to boot), and now, someone "on the inside" has come out to claim the whole thing is just one big scam. Dr. Joseph Roche, an assistant professor at Trinity College's School of Education, is one of the 100 "finalists" for the mission, and has quite a few doubts over the way things have been handled. First up, while Mars One claims the initial volunteer pool numbered close to 200,000, Roche says that the actual number was a paltry 2,761. What's more, he says that quite a few of the finalists have simply "bought" their way in, rather than being actually qualified, and that Mars One is actively encouraging all finalists to "donate" any earnings from media appearances and the like to the organization. "When you join the 'Mars One Community,' which happens automatically if you applied as a candidate, they start giving you points," Roche explained to medium in an email. "You get points for getting through each round of the selection process (but just an arbitrary number of points, not anything to do with ranking), and then the only way to get more points is to buy merchandise from Mars One or to donate money to them." Roche finds it very odd that a company seeking six billion dollars in funding for its mission would be asking its candidates to donate the "pocket change" earned from media appearances and merchandise. 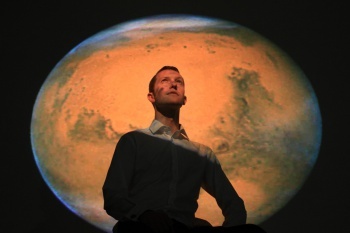 Furthermore, despite being in the top 100 candidates... Roche has never actually met anyone from Mars One personally. "Initially they'd said there were going to be regional interviews... we would travel there, we'd be interviewed, we'd be tested over several days, and in my mind that sounded at least like something that approached a legitimate astronaut selection process," he said. "But then they made us sign a non-disclosure agreement if we wanted to be interviewed, and then all of a sudden it changed from being a proper regional interview over several days to being a 10-minute Skype call." Roche's biggest fear is that when Mars One inevitably fails, it may shake people's faith in the scientific community. "My nightmare about it is that people continue to support it and give it money and attention, and it then gets to the point where it inevitably falls on its face, if, as a result, people lose faith in NASA and possibly even in scientists."